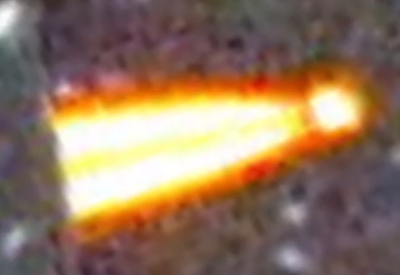 Long cigar shaped silver and metallic looking UFO which starts to disappear right above a set of traffic lights on a public highway with an eye witness who films this extraordinary event. 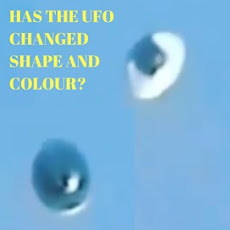 The image below shows the UFO right before it disappears from sight altogether. 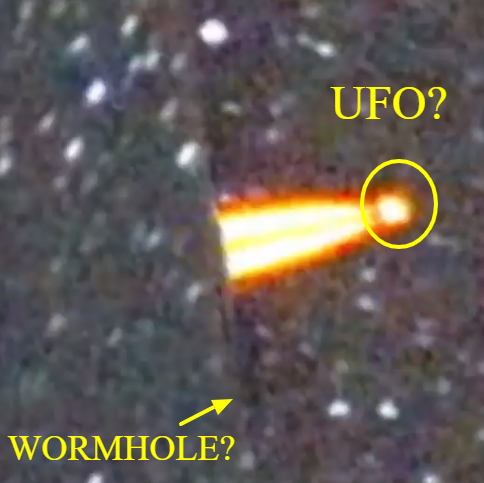 It's difficult to determine what it's disappearing in to or if it's the UFO itself just vanishing from view? There's no real way to determine this, but my best guess is that it's going in to or behind a cloud. This amazing looking silver UFO has the classic "cigar shape" and it's also got that metallic look about this which is what got my attention as there's nothing propelling it or making it hover and that's unusual. 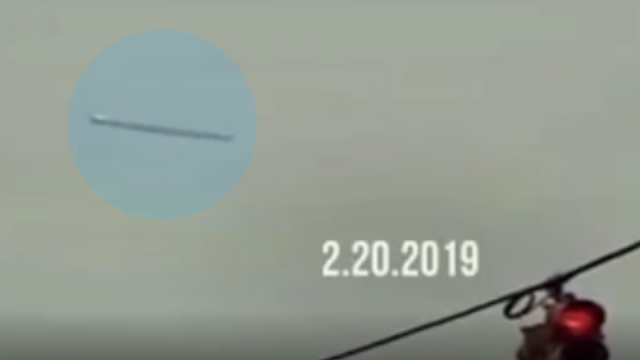 There's many UFOs which have been seen already this year (2019) and this UFO video was recorded on the 20th February 2019. It's not that long ago actually and this is probably a contender for best looking UFO so far? 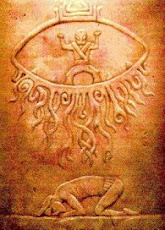 People always go off what these UFOs look like right and it's the first thing that draws us in and it's how people get their first impressions of UFOs which this one really does deliver on many of the things listed above. What Is This Strange Cloud Formation Over California. This was uploaded to Instagram by UFO Lovers and it's a favourite with the viewers and that's because it is probably real. 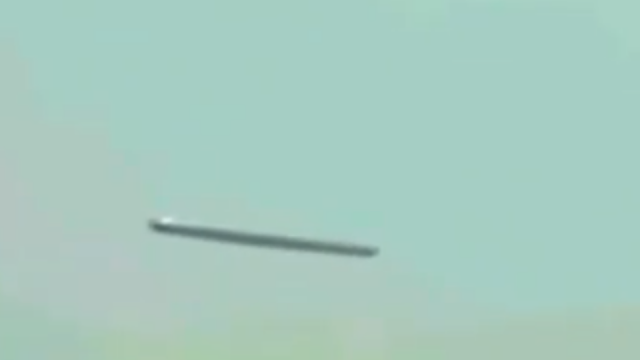 Guys, there's hardly any information with this video and I've even done a Google image search but it's not come up with anything from anywhere online, other than this is resembling a Bird or a missile according to Google? 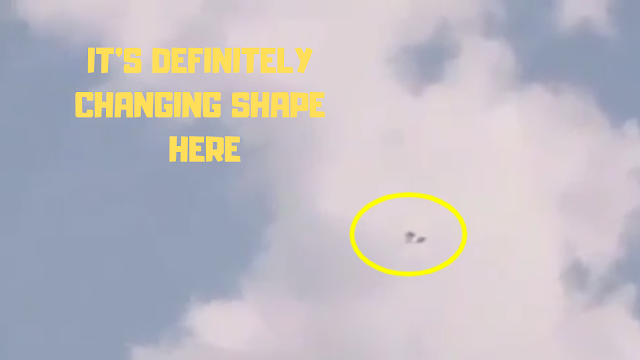 So because of that I can only assume that this is a real event as nobody has done a screen grab from anywhere else and pasted it in to the video which is great news for Ufology. 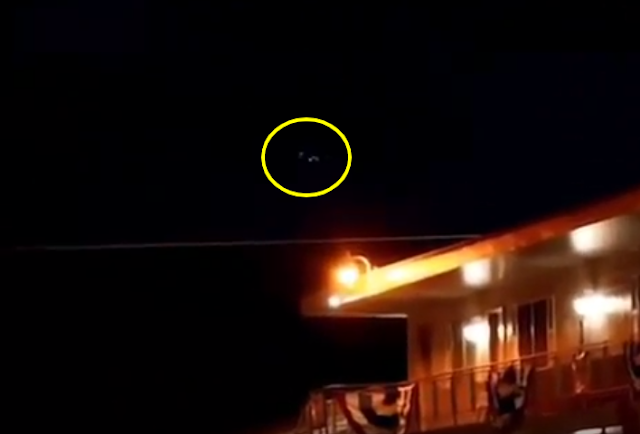 Not been anywhere else online especially in the image form, doesn't mean it's not a fake but it does give this a bit extra credibility (in my own opinion it does) and this could mean though that it's a genuine UFO sighting as the first time this UFO was seen - is in this video (below) and that's a good sign. Either way guys this is still a great UFO video with a really good feel and as soon as you see it you feel that this is interesting. When you first see it also you definitely want to see more of it, that's exactly what I felt anyways? It's just because it's long, silver, metallic and starts to either disappear or it is gradually vanishing before this eye witnesses eyes? It's interesting for many number of reasons. This is a quick post because I want the video to speak for itself. 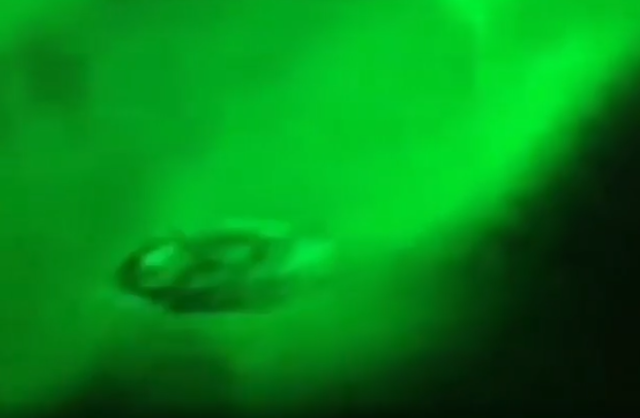 I Came across this UFO video which was caught on film by the International Space Station (ISS) during an Aurora Borealis or Northern Lights event. It's absolutely epic, it's just the most amazing I've seen in a long time. I want your thoughts and opinions on this guys no matter what you think it is, let's have a look at this one as I really do think this could be one for the books "again"! I'm convinced that we're absolutely narrowing down the list of real UFOs guys. I'm convinced that with your help we are moving Ufology in the right direction and this "if right" is just the best thing ever. This video above, it's just stunning don't you think? Please share it and let's get some answers to what this could be? It could only really be a UFO don't you reckon? Either way this is a brilliant anomaly. 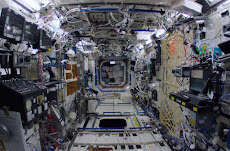 Source NASA - ISS (International Space Station). 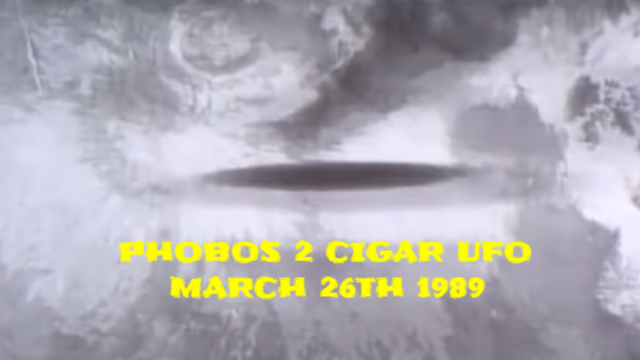 Phobos 2, probably the most interesting probe in human history because of it's encounter with a huge Alien Mothership shaped like a cigar. There are many, many versions of what actually happened or in my opinion "speculation" as to what occurred on that day in March 1989? 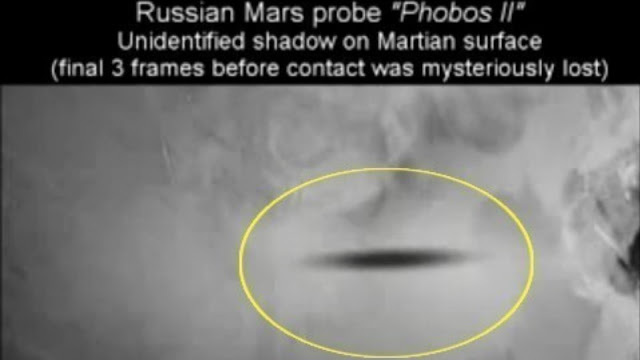 We need to stay on track and only go off of the evidence which is plentiful and in this case it's the last transmitted images which tells everything we need to know about this huge UFO encounter in Mars' backyard. Buzz Aldrin Admits To Alien Structure On Phobos Moon. Phobos is the innermost and larger of the two natural satellites of Mars, the other being Deimos. Both moons were discovered in 1877 by American astronomer Asaph Hall. Phobos is a small, irregularly shaped object with a mean radius of 11 km and is seven times as massive as the outer moon, Deimos. Well, we've got to stay on track and not lose focus of the facts. The facts are in the Russian space agencies (Roscosmos) images. 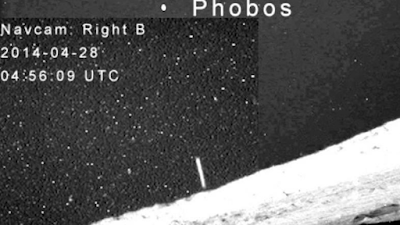 The Phobos 2 last transmitted images. 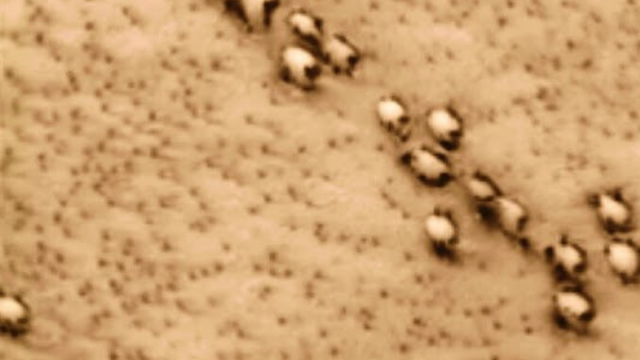 These actual images are not speculation but what is on them, is speculation. 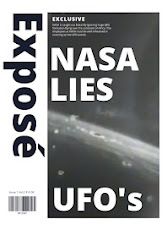 The title of this post is speculation but it's the widely accepted opinion or theory should I say - outside of the Russian space agency Roscosmos and NASA. 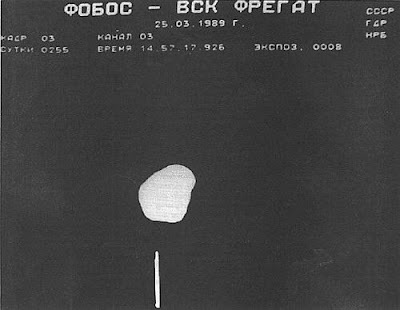 Phobos program was an unmanned space mission consisting of two probes launched by the Soviet Union to study Mars and its moons Phobos and Deimos. Only one of the probes made it to Mars, and just days before it was due to land, it sent a few mysterious photos to mission control before going offline forever due to a critical failure. 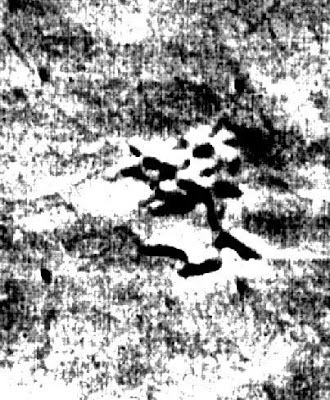 The Mars orbiter had returned 38 images with a resolution of up to 40 meters - before the strange event caused a failure and it was lost forever. Evidence suggests a possible alien encounter. Since that historic event, space agencies around the world have quietly funded extraordinary experiments, sent alongside successful missions, such as the Mars Global Surveyor, Mars Express, and Mars Reconnaissance Orbiter. With the hope of uncovering the mystery of the Phobos anomaly, these secret experiments may provide the data needed to either explain the 1988 event or confirm the existence of an exotic force protecting the moonlet. Yes, it's true. Secret missions along side the main missions are usually called clandestine, top secret, classified, eye's only, collusion and on a need to know basis etc etc. Why are they called this, because they don't publish their findings. They will not divulge the discoveries "if any" to anyone outside of the secret program(s). So it begs the question, what if anything could be the answer to this decades long anomaly? The huge "Alien Mothership" absolutely left everyone in that Russian agency in no doubt that an Alien UFO Mothership did indeed destroy their probe just above Mars. But, Russia has NOT gone back ever since. Why? What else was beamed back with these images? Was there a stay away note attached or was there an image or video which showed more than shadows and a white tube? Did they get a full on view of an Alien with a gun and a message wrote on paper looking at the camera which said "come back and your dead"! Well, whatever it was the Russians haven't been back. 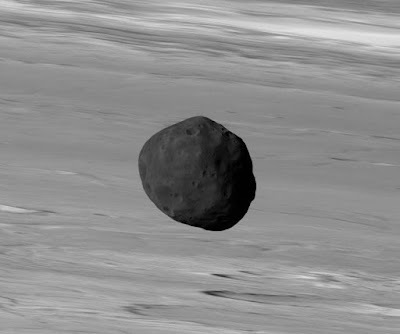 So, what's on Phobos in the first place? A monolith, which is a geological feature consisting of a single massive piece of rock. Monoliths also occur naturally on Earth, but it has been suggested that the Phobos monolith may be a piece of impact ejecta or even an ALIEN structure. 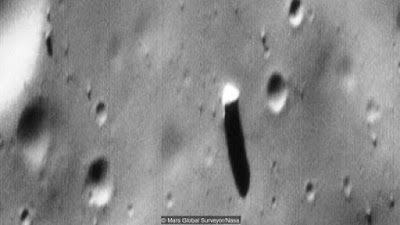 The monolith is a bright object near Stickney crater, described as a “building sized” boulder, which casts a prominent shadow. There in plain view, a large rectangular object undoubtedly resembling an artificial monolith stands alone. Source Reference Cool Interesting Stuff (Unexplained Mysteries). Source European Space Agency (ESA). 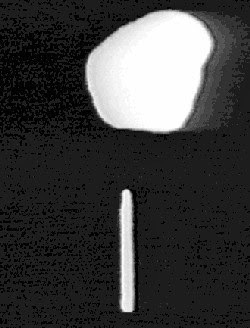 Source Reference Monolith On Phobos (USF). 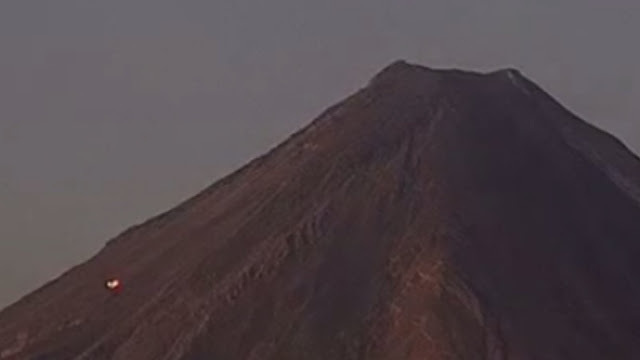 Here is a very unusual UFO that has been recorded on webcam passing this volcano and then it is still recording when it mysteriously is seen at the side of the volcano and it stays around for a few minuets then it goes back the same way it cam from. 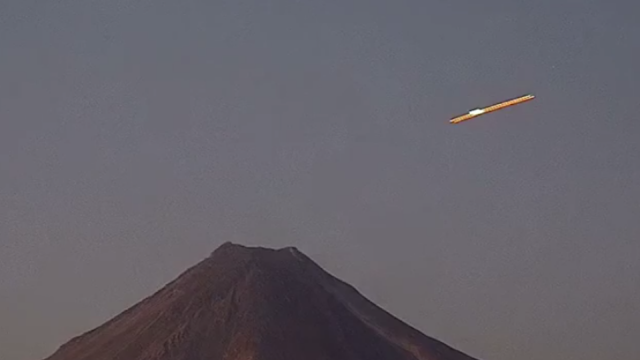 What was this UFO looking for and what was it doing near a volcano? 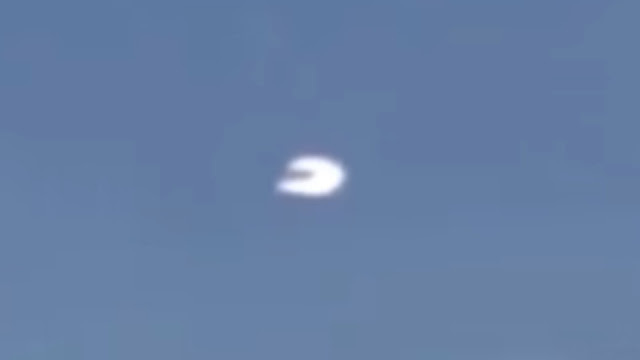 I'm guessing it's a Cigar shape UFO as it's obviously recording in so many frames per second that objects going this fast looks like Cigar shapes. With only a long exposure webcam that is recording the way it is we can only really have a guess as to what this would actually look like? It's definitely bright, it's definitely fast and it's looking for something, but what? Huge Black Pyramid On Asteroid. It has an energy source which is not leaving any trails and there's no other lights on this aerial vehicle. 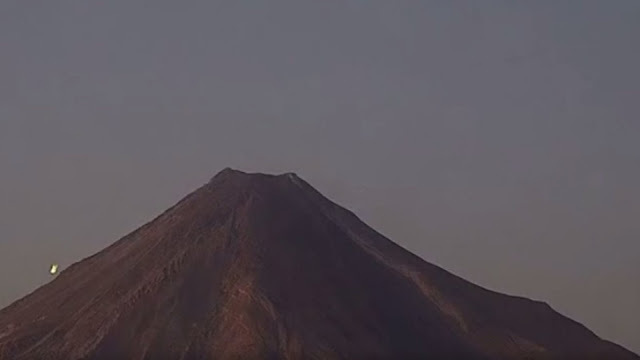 On the night of March 12, 2018, around 19.18, the webcam that transmits live images of the Colima Volcano and part of the Volcán De Fuego that is about 2-3 km away, records the transit of a mysterious object of light that slowly passes through the Colima Volcano. this is an epic UFO moment where you know that Aliens are up to something on this planet what with all the evidence, the hard to fake or hoax videos and it all leads to one thing. Aliens are real and they are sussing us out. Everything about this UFO seen speeding at least 500 miles per hour in Utah near Area 51, yells real. 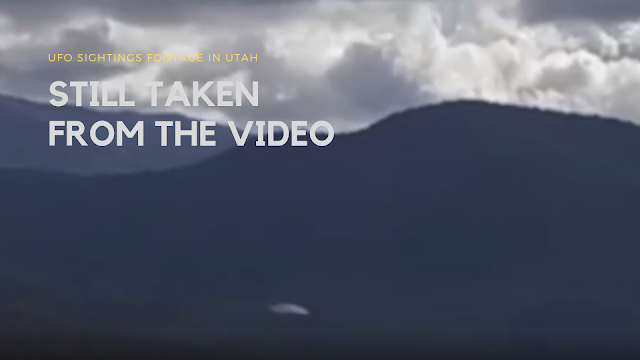 Documentary camera operators where in Utah near Beaver not far from the notorious Area 51 filming scenes and looking for epic landscapes and locations for B roll backgrounds and a "very real UFO" shot past them without them knowing, until later. For me, I believe this is real. Documentary films is what they do which means they go out and scout Utah (and other states when necessary) to find suitable amazing backdrops for the documentary film they're working on (dream job by the way). 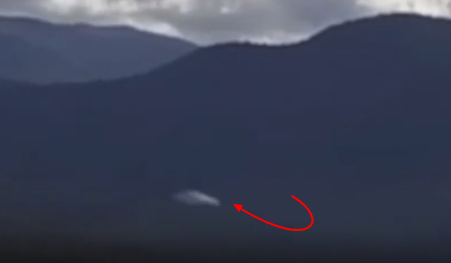 It looks like this UFO (possible Flying saucer) came from the trees on the other side of the mountain or ridge but it was definitely far away as it was like a dot at first! It's a silver metallic UFO with a flat bottom on one side and a half sphere or dome on the other side which is the top of it. It was caught on camera footage on the 9th January 2019 near Beaver in Utah. It's very, very fast as a smaller UFO and this is kind of "more unusual" because something is giving this small aerial vehicle tons of energy to move that fast, BUT WHAT! Anyways, to cut a long story short they got back to their hotel and went through some of the days footage only to discover they had caught an Alien visitor or an Aliens vehicle (UFO to us) which in my view these smaller ones are for obviously spying on Earth. Unless the Aliens are tiny like the small Alien in MIB (Men In Black) inside that guys head and when it got damaged and the head opens up in half - it reveal's a tiny Alien actually inside the head with that classic large head and large eyes but overall it's a tiny Alien. So, unless one of them small Aliens is inside this UFO then this is probably on a preplanned or "learn as it goes" mission - gathering as much info as it can and when it's data banks are full it then purges it's gathered data (intelligence) but in to space. It flies up as high as it can go and blasts it through space as a signal maybe back to it's relay station which then relays it back to whatever etc etc. Call it a sentinel or call it a drone but it's there in reality and it exists? If this is real guys then it's not here for a stroll in the park! It's here for exactly the same reason that we would send a probe to another world if we come across one! To assess the threat it could possibly pose to us, which they possibly could pose? So they're only doing what comes natural I would say. To gather info or intelligence as they might call it and see if they have a weakness? Maybe every real UFO here on Earth has a specific task because just like what we would do - is not put all our eggs in one basket! 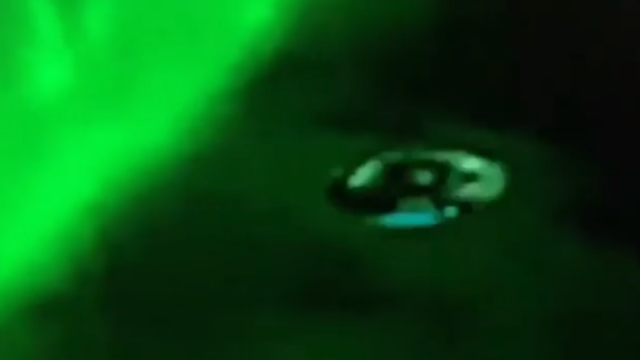 Silver UFO Spotted With Clear Details When Zoomed In. Compartmentalise each UFO or probe with a specific task in case it's damaged or caught or lost. Maybe that's why we keep on seeing lots of similar looking UFOs because our governments are catching them or recovering them? They're all part of a bigger picture, maybe? Could they all form a chain of "preset assessment or analysis" of this planet. But i really believe that this could be one of the top 1 percent of real UFOs. These guys job is to scout for "epic landscapes" plus time fillers and locations for panoramic views that sweep around to reveal amazing places and stunning locations and like he say's in the video, he wasn't expecting anything other than what they set out to film, to be on the tapes? So if your still a non believer at this stage after seeing this video then you could always check out the full RAW video which this video above is just about half of it? The link is in the sources and credits section at the bottom of this page. Source Bian Hanley Original Raw Footage With Interview YouTube. 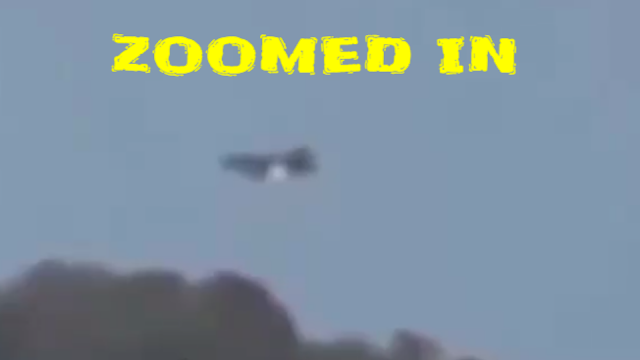 Source Reference Silver UFO With clear Zoom In USF. Source Image Credits/Sam Chortek Jimmy Chappie. Source Reference Map Of Beaver In Utah. 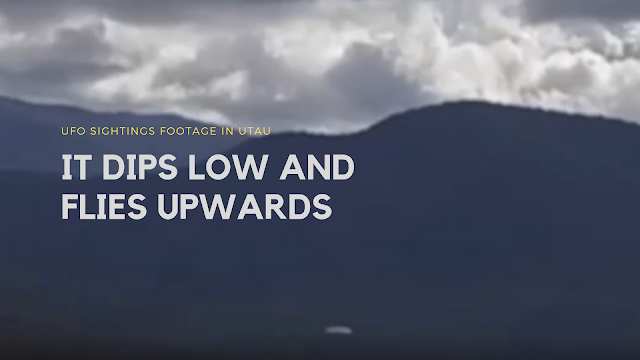 This is a UFO sighting from the side of a mountain nearer to the top of it and as it comes round the tree line of the mountain it turns a bit, it starts hovering but moving to the left of the screen and then all of a sudden it bolts upwards and towards the top left of the screen. 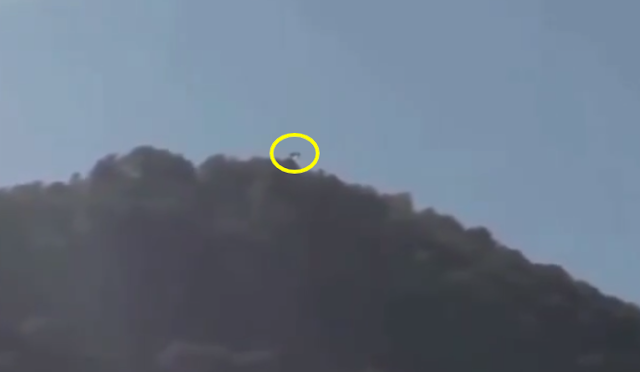 On a closer inspection of this UFO seemingly hovering around the top half - near the very top of this mountain actually it would seem that it's looking for the right spot to take off? I wonder if it's hard to steer when it's going as fast as it goes? You can see when it takes off that it's absolutely belting it really fast, so I'm wondering if if it has to be lined up first! An Alien UFO looks like what? UFOs fly according to what type of flying? A UFO has got what types of look? Exactly guys and I'm worried that the UFOs in the past where I've instantly rubbished them or I've brushed them off as fake - well I'm starting to take my own advise and think who am I to say what's real and what's fake? I don't have a special ability to do this that I know of? I can't distinguish a real one from a fake one (I have common sense and that gut feeling when I see something I think is real) but I mean, come on nobody has that ability to definitively say it's real or it's a fake UFO, right? Just because something looks to bulky, or it's the wrong colour, the wrong type of speed. I mean when I hear it back out loud to myself it sounds absolutely ridiculous that I did this! If it looked a bit to shiny, I was dismissing it. If it looked a type without any shadow where I thought it should be I'd dismiss it and I probably don't know for sure where the shadow on that one went, as I couldn't see the sun etc? 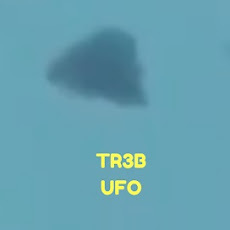 The lack of information with this UFO video doesn't mean anything as the eye witness may wish to remain anonymous and even revealing the location could identify him? This I totally agree with, it's up to them. So guys, seriously before we start to dismiss (me definitely included in this). I'm going to start to not be as judgemental or think that "I have all the answers" because I don't and nobody and I mean nobody can do that unless your work involves NASA lies, secret departments, classified programs and part of the recovery teams of crashed UFOs - oh and also, the Aliens themselves? How could I forget the Aliens, lol. So guys, I'm gonna let you decide on what is real and what is fake in the video and as I say, this could very well be real? I'm pointing out that this really could be real as the persons reaction sounds absolutely real and legit to me. That could be all well and good but it could still be a drone with warp drive thruster engines and the ability to take off faster than a Jet or any known aerial vehicle known to man/woman? 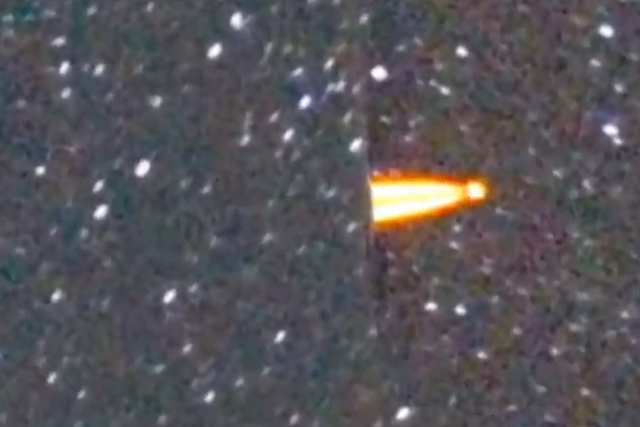 This extraordinary to say the least seeing this UFO going in or coming out of what looks like a wormhole caught on the webcams of ESO European Southern Observatory. I was just sent this amazing video by a guy wanting, actually he's "needing" answers and hopefully we can get some answers from our amazing viewers? 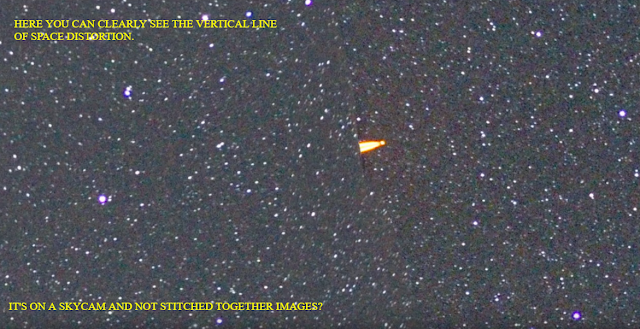 You can clearly see something is coming out of (or going in) a "roundish space distortion" but to us in this image it looks like a vertical line of space and it's definitely unusual looking - if not even strange. It's a fiery colour and seems to be round at the tip and I'm wondering if this is the UFO leaving a trail or is this only half of the UFO that we can see and the other half is yet to come out still? Is it this or is it the end ball like shape which is the UFO? 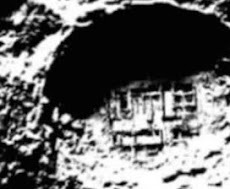 10 Ancient Sites Said To Be Real Stargates - Portals And Wormholes. 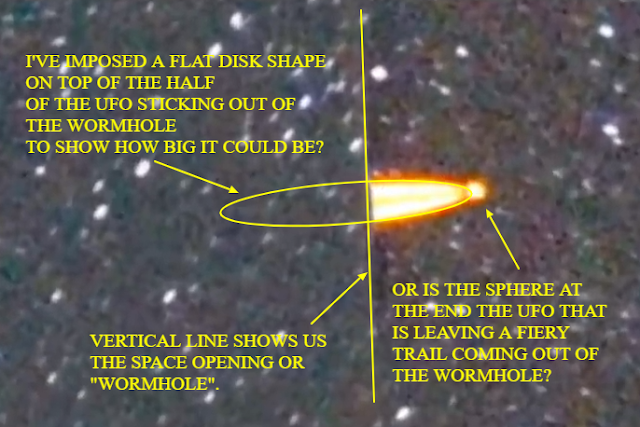 Either way guys, this is absolutely what we would expect a space distortion with a UFO coming out of it to look like - so that is why I am posting this. Well not quite, there also things like the definition on the UFO like this amazing orange line going horizontally through the "thing" from one end to the other. And the round sphere like ball at the end which also could be the UFO. 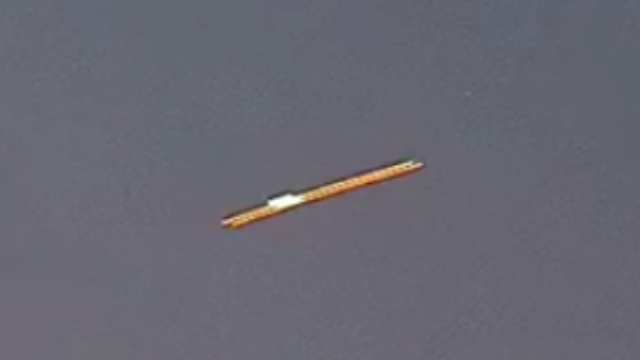 Is this a UFO Sphere at the end with a clear and visible trail that it's leaving behind, I honestly can't tell - but it looks like it's cut in half because it's coming out of a wormhole? This is most intriguing AND it was only seen today so it's hot off the press nobody has seen this except for a very few people. I'm sure there will be a lot to say about this and arguments to and against but still, it is early days for this as it was only caught on camera today which is the 12th March 2019. the skycam used in question was this publicly available to use called ESO (European Southern Observatory - link at the bottom in sources). Don't forget we're just like you, we want answers aswell? It's always good to get constructive opinions and answers. Strange Alien radio signals coming from structure underwater. How strange is it to see this though and yet even before seeing one like this, we can imagine what an event like this would look like? That's strange and then low and behold - we encounter one on a skycam for all to see? This for me personally this proves the existence of destiny, that we've been here before and done this countless times before on an endless loop. We imagined this before we saw it because we already have all the knowledge possible within us. That's why we can learn! That's why some people "take to skills like a natural". Like it was made for him or her. I don't know how, but I just know? How many times have you heard this? It's as if I just knew etc etc. I can feel it? Coincidences, serendipity, luck, chance call it what you like but it is a force, it's a force of energy and it is real. It's innate and it's been there from the start. I've only just been sent this and am still in the process of getting the information etc, like which skycam did this come from and where in the sky is it coordinates wise. I do know that the person who caught this wishes to stay anonymous and that's their rights which I fully respect. When I get the relevant public information on this, I will update the post. I wasn't waiting for that as this needs to be seen by the public and if you know my posts - then you'll know that it's the content of the videos or images which I always prioritise. 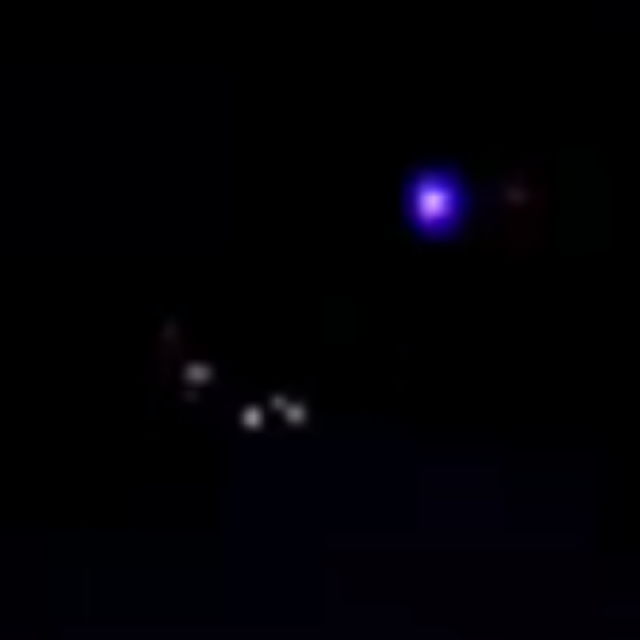 Source Mysterious Blue Space Entity YouTube. Source ESO - European Southern Observatory. 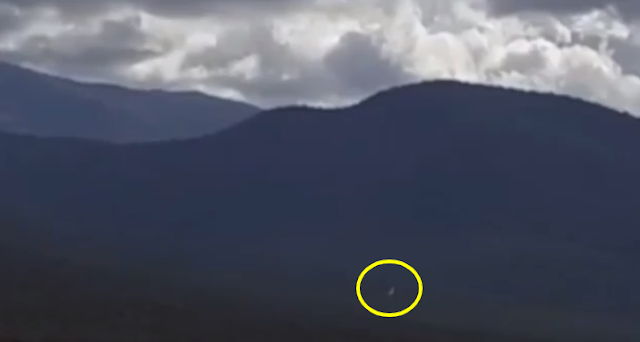 Prometheus style UFO caught on video racing over the sky line of Vancouver in Canada in 2014. Although there is speculation whether it was filmed over France and was uploaded by the YouTube channel ZealotinAll Black3 but the controversy continues as this YouTube channel was terminated for breaking the so-called "communities rules". This also add's to the mystery. The resemblance to the Prometheus movie - Alien spaceship is uncanny, to say the least. Is this a real UFO or a hoax, well I'm going to go with "it's real". Why because it's now 5 years later and nobody and I mean nobody has come up with a satisfying rebuttal or rebuff to say this is a hoax. There is nothing fake that I know of - or can find about this anywhere online. People are definitely wanting this to be real because of the whole Prometheus connection. But saying that it's really cool, it's really one of the better looking UFOs that there possibly is, bar none. It's all down to the person, you. Do you believe this is real? I believe this is real. I've said it before, there's no antennas. No aerials, no jet engines coming out the back and it's a big UFO not a small one. You can't really see it's size but I've been following this for a while now and it's not small put it that way. It's silver underneath of it and white on it's top (does that mean anything to anyone - has anyone seen anything similar), it's under intelligent control of which I have no doubt about and the lack of media coverage tells me there's more to this than meets the eye. Still, 5 years on and this thing is generating interest and the story is evolving. I said in my first post a long time ago (link below in sources UFOSFOOTAGE) that I will update that post as and when new info comes up. It's been accepted now that it was more than likely filmed over France. We don't know exactly where in France but as soon as we find out where in France we will definitely update this whole story. Someone has even suggested that the Aliens are experimenting on us so that the future war they can release specific chemicals for maximum kill rates here on Earth. They are experimenting on us and these UFOs are in their itinerary of Alien vehicles allowing them to expedite and carry out their devious plans all the while the government can't do a thing and that's because they haven't even accepted they exist! If it comes out later on (which would be way to late by then) that these "are" being used for that purpose then to know that the people in the government's petty and silly denials of the existence of Aliens and UFOs - is all that stood in the way of combating it and creating a deterrent or planning, or even a way to win any chemical threat would be devastating to take in! But, that's pure speculation guys. Instagram is one of the best if not the only place to find published UFO footage or eye witness accounts of UFOs that was just seen by people as YouTube etc has a massive, way to complicated and "form related procedure" just to publish a video? Plus Instagram allows eye witnesses to video live UFOs in real time. It's a great source and yes, we're on there to. It is fantastic as you probably already know because everyone and their dog is on there "literally". 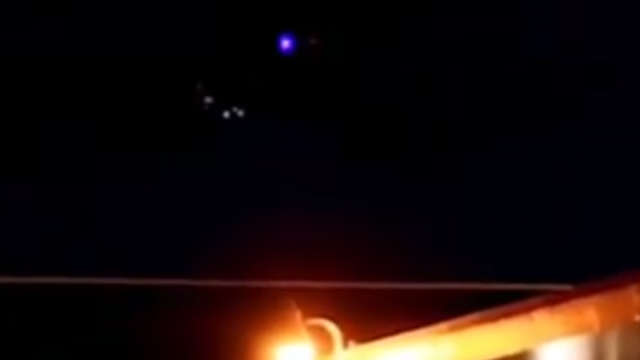 This has really got my attention as the UFO in this amazing video looks genuinely real and has an unusual profile such as the way that the lights are configured in relation to what we know are on normal aerial vehicles. It doesn't match any that I know of, plus the colour of the lights and the sirens that we can clearly hear in the background noise makes me think that this has got to be a genuine UFO incident? Because we can clearly hear sirens, it's my assumption they are on their way to confront this unusual UFO footage maybe to apprehend it, try and communicate with it or something else entirely? Like cordon off the area or such? 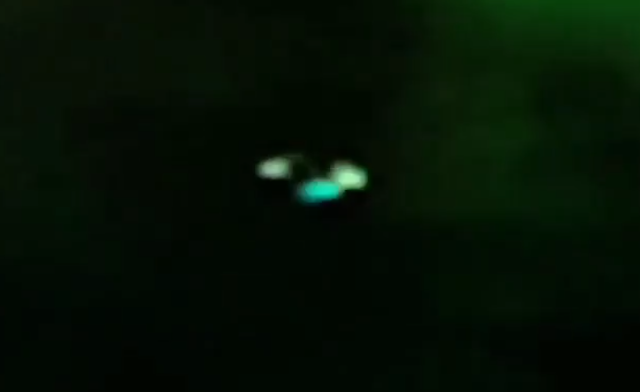 The sirens might have nothing to do with the UFO but my gut feeling tell's me that they are racing to this UFO. Is this a drone, absolutely not. It's way, way to big for this to be a drone. It's not working in conjunction with another drone(s) as the lights are to evenly blinking and they aren't coordinating. 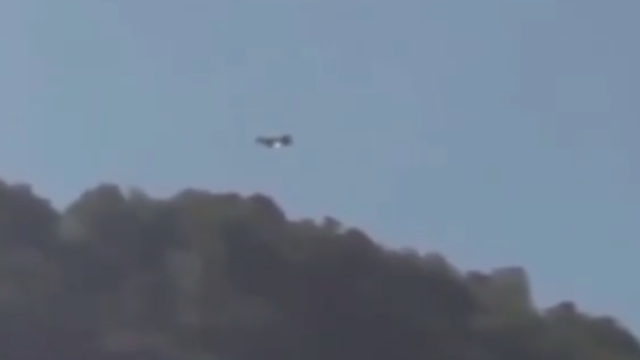 This is Bridgeport in California and I'm pretty sure that UFOs are a common occurrence there so it makes sense that people would recognise this as not a police helicopter, military aircraft or a "weather station aerial balloon" or helicopter. Considering we can hear the sirens but not powerful helicopter motors tells me that this is another time we can tick the box on the yes poll! Think you may have caught a glimpse of a metal, sphere-shaped object looming in the night sky above? Well, you're not alone. According to a new UFO reference book, self-published by two UFO experts, California is the top state with the most UFO sightings in the country. California is followed by Florida, Texas, Washington and Pennsylvania respectively. New York came in at 6th followed by Arizona, Illinois, Michigan and Ohio. 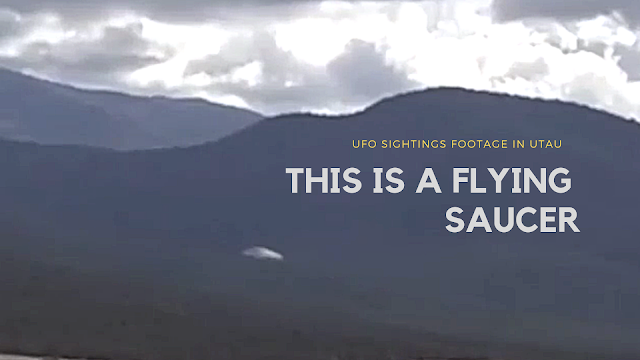 It's a genuine UFO until proven to be an escaped "swamp gas" from the local swamp gas detention facility, lol. It could be a weather balloon recently retired on a night out with a valentines day balloon in the shape of a heart? At this stage it's unconfirmed. Sorry I had to poke fun because it's about time "we" had a solid UFO sighting without any doubts that this is a genuine and eligible, Alien vehicle! We don't often get these and we have to rely on previous UFO sightings. So yeah, I'm kinda sticking my fingers up at the doubters and the hoaxers who deliberately ridicule and who always show up in the comments when a hoaxer puts a silly looking fake UFO image or video up and claims he saw it but it's obviously a fake. It's that deliberate attempt at dismissing Ufology that get's me wound up. It's that deliberate undermining of Ufology research that winds me up. 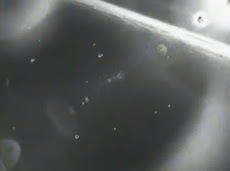 Source Reference USF Silver UFO.